I can’t believe I never shared these with all of you. I photographed them last fall and have made them many times since because they are one of my favorite appetizers – Spinach Dip Pastry Bites! There is very little prep work, plus they only take 15 minutes to bake in the oven. 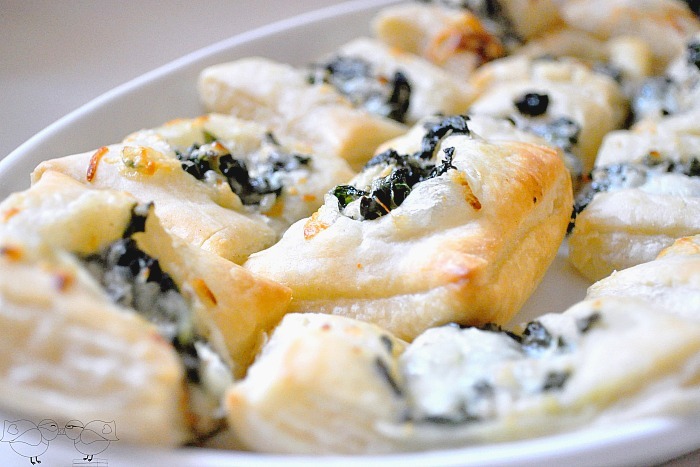 If it isn’t already, puff pastry should become your best friend for all (gluten) appetizers. I always have a couple boxes in my freezer for last minute recipes. 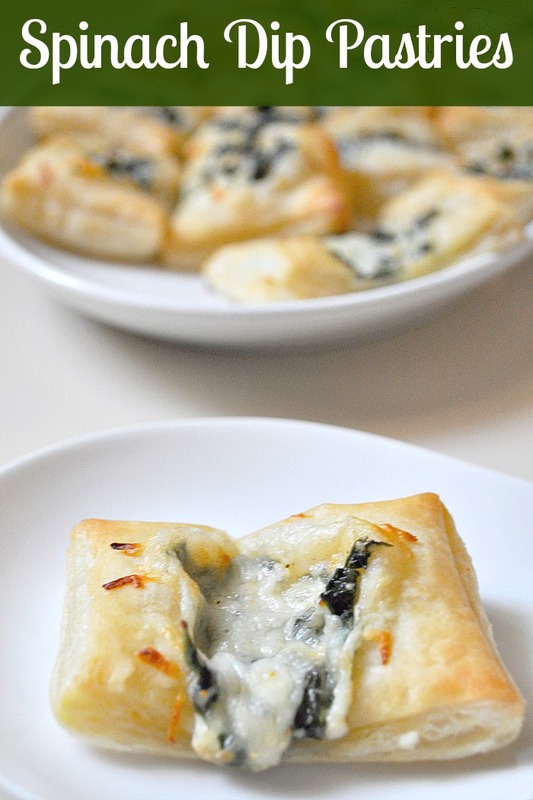 So I am sharing these Spinach Dip Pastry Bites with you today – PLUS A GIVEAWAY for a KitchenAid Mixer, so you will want to keep reading till the end. If you aren’t sure if you want to give these a try, the only thing I can say is that my father-in-law said he loved them, and he is an absolute whiz in the kitchen. He has taken cooking lessons, loves to experiment with tricky recipes, and is a little intimidating to cook for because his food is always amazing! He loved these though! I guess I can say one more thing – my husband, who describes vegetables as tasting “green” and who seems to have an aversion to all things that could make a salad – also loves this appetizer! When your puff pastry sheets are defrosted slightly, press down on the seams to make sure it is a solid sheet. Then, take a pizza cutter or knife and cut each sheet into 16 squares (or smaller if desired). Heat oil in medium skillet over medium heat. Cook spinach until slightly wilted - about 3 minutes. Then, add garlic, cook and stir for another minute then turn heat off. Place softened cream cheese, sour cream, cheese, chili powder, black pepper, and spinach combo into a medium bowl. Mix well. Add some of the dip onto the center of each puff pastry square. Bake for 15-17 minutes until they just begin to brown on the edges. Remove and let cool for 3-5 minutes before serving. Would you like a FREE ebook? Check out Made in my Mixer. You will find over 20 recipes that are perfect to use with your own mixer. Isn’t that fun?! Do you have a favorite recipe to use in your mixer? These look amazing!!! Do you think I could make them ahead of time and freeze them so I can just pop them in the oven when I’m ready for them? I’m not sure. It might be possible; I’m just not sure how it would influence the cooking time. It sounds like a good experiment I might undertake. I love the recipe but most of all I completed love the beautiful Red Mixer! I love my Pampered Chef Spatula set. I utilize the big one with the rectangular spoon form into it when I make fudge for the holidays. My mixer is my best friend during the holidays! My mothers wishing cookies are a very thick dough, and they’re tough to mix by hand. 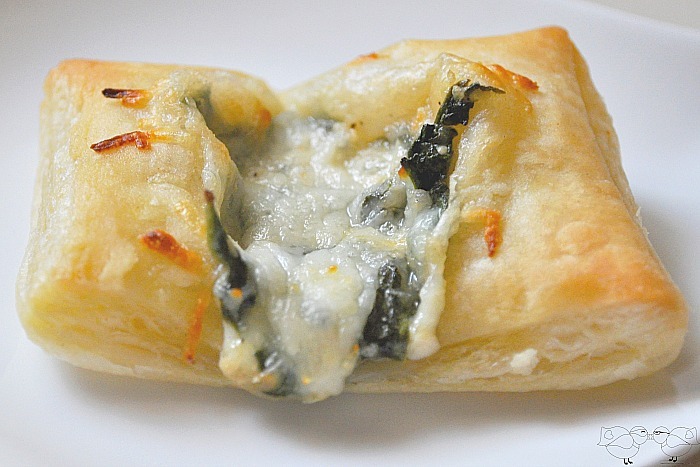 I do have a KitchenAid but I love your spinach dip pastry bites recipe!!! It looks so amazing! I am pinning it right now…I want to make it! I just shared your page on FB and mentioned your giveaway and recipe! If you have a moment, I would love it if you would link this recipe up with us at Foodie Fridays! I think it would be a huge hit! Spinach Dip is one of my daughter’s FAVORITE things! I have to make these spinach dip pastry bites for her! These look like little bites of heaven to me! Thanks for sharing this yummy recipe!